Good Company Changelog: #003 All on board! Good Company not only is about technology, it’s also about people. To emphasize this fact, we thought it would be nice to have a friendly face welcoming new players. Meet Granny, in our new tutorial! Yes, that’s right. Even in that early phase of development, there’s so much to do in Good Company that we figured, a tutorial would be a nice idea. You’re welcome. And since helping our your kin is a noble endeavor, granny is happy to count on your support while manufacturing your first calculators. 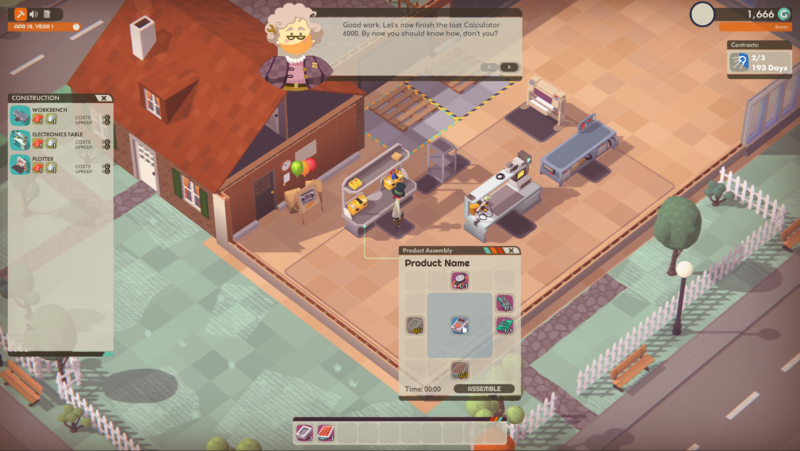 That might sound underwhelming, but rest assured, you’ll be busy learning about setting up a work zone, build the work tables you require, craft modules and assemble them into a neat new product. Do it with dignity and prove yourself worthy of the legendary career that might lie ahead of you! And, wait for it…, waiiiit for it… there’s more! Indeed. More features for your playing pleasures. And less bugs. The contract preview lets you check the most important information about your contract in progress. A clever scenario system lets us (and later you) build custom, eh, scenarios; like the tutorial, for instance. Often neglected for early versions, your ears will be pleased by sounds providing feedback and pleasure. Speaking of audio: there’s also a bunch of first tracks for the OST, and a nice music player to check them out. Did we mention bug stomping? We did. Nevertheless: bug stomping!